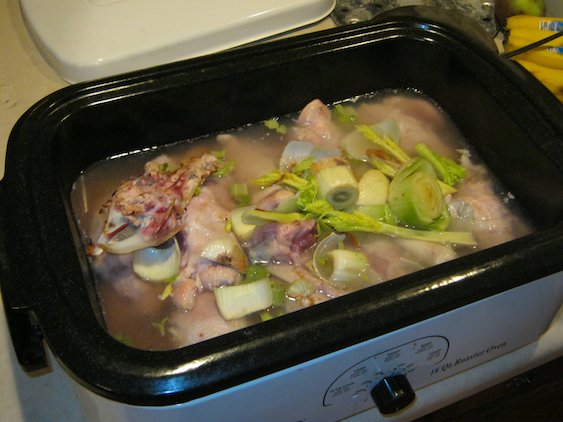 Today is the last day of the bone broth marathon. How did you do? I managed to meet my goals more days than not. It has established a habit, which is more important. It will be FAR easier to repeat this next winner without the kids asking questions. The weather in NC has been unseasonably warm, so I’m expecting winter to last until the end of March or later. We’ll continue the soup and extra stock as a normal part of our routine until it’s too warm. How about one last recipe for the series? This is a soup I fall back on regularly when I need something quick and easy. Navy beans are a cinch to sprout, so I keep extra on hand in the freezer for meals such as this that are quick and easy to throw together and can cook while I do other things. Combine the cooked beans with the remaining ingredients in a crock-pot and cook for 4-6 hours on low.